I’m teaching technology integration as part of a teacher licensure program at the University of Richmond. The classes are small and made up primarily of career switchers. They often seem less than thrilled to be greeted by my baby face and currently very uncut hair. I try to make up for this by referencing my 97 careers, 13 children and then doing everything from the command line. Here’s one of the things we did on the first day of class that seemed to work pretty well. I read this on Dan’s blog way back when. I wanted to use it then and I’ve been waiting ever since1. You’ve got 25 minutes to come up with a four slide introduction for yourself. What should we know? What makes you stand out? Why are you here? These and other exciting questions will be answered. I pitched is as a mix between the standard first day of class introduction and impressing a perspective employer. I showed them a few examples from Dan’s page. That may have been a mistake as it seems to have intimidated a few and I wonder if it colored the design choices of some others2. This is a technology integration class. I need to know something about these people so I can remember their names. I’d also like to get a snapshot of both their design skills and their ability to use basic programs. Why not combine all those things and knock it out quickly. I know the time was pretty tight for something that is really quite difficult to do (conceptually if not mechanically). I rationalized it because the time limit would keep them hustling, keep them from wasting time with animations and other useless junk and we only have 2 hours and 45 minutes of class. I was pretty pleased with the activity. People were engaged and working hard. The results good. The presented them and I learned some interesting things about the students3. Most importantly, I started off the class with the idea that you can figure out how to use most applications. You don’t need your hand held from start to finish. I pointed out the help menu and mentioned googling for answers. I did give out a few tips for those new to the Mac which they were then able to use immediately and repeatedly. I also mentioned how what we were doing was a pretty good way to think about using technology in the classroom. Keep the time tight. – You can always extend it if people are working hard and on task. Make sure there’s an end product. – Have something produced that will be turned in. Move around and observe – offer tips for people who seem stuck or frustrated. After reading Rives’ blog and seeing the description of the death race my brother-in-law is going to run- I’ve decided to work on becoming a poet who dabbles in extreme races but only if they involve chopping wood, barbed wire and deep diving. Step one– build extreme race practice course in backyard and being working on flowcabulary cds (it’s like hooked on phonics for poets, right?). 2 That may be ok in the end. But it might be more useful to get a clean impression of where they are. 3 One of them gets microscopic worms drunk for a living and another has several large pet snakes. Big version here Probably not much use to U.S.A. teachers but I was listening to a song by Dizzee Rascal (he’s big in the UK – I swear). 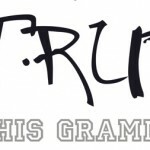 The phrase “true to his grammar” was too good to resist and there were some great high resolution shots out there. So, once again you get a classroom related rap/English poster. Remember the whole point is to find interests you and your students share and then leverag them to the hilt. Despite growing up in Alabama, I like rap, always have. If you don’t like rap and you try to fake it things will go very, very badly. This is true of most things in life and in teaching. Faking = bad. (that’s the condensed wisdom of this comment thread) If rap, or strange UK rap, isn’t for you (or your students) find out what will work for them and you. Then come up with ways to use it. This comes from a guy who used to dress up like a ninja to discuss backing up computers. Strange things work but only if you’re really behind them. Take a risk but make it one you believe in. On another note- go vote dy/dat for best individual blog and best new blog. If you aren’t reading him, I suggest you start. 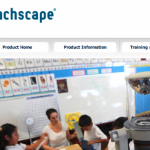 We’re looking to get more classroom video for a variety of reasons and that led to a demo from Teachscape and their Reflect product. It’s a decent idea, 360 degree video of the classroom and another camera with a specific focus. You can’t see anything about the quality in the demo videos. One major warning flag is that they don’t have any video from the product. No obvious prices. Let’s just say it’s really expensive, really expensive. Expensive enough that I can’t remember the numbers properly because my brain filed it under crazy. It looked even more insane when I happened to find the Sony Bloggie. I’d never heard of it but it seems pretty similar to the Flip and it has an attachment for 360 degree video. There’s also some interesting ways to hack it to get higher quality 360 degree video out. All for $170. If I was going to spend the money that Teachscape wants for their unit, I’d want quality like Yellowbird. This stuff is slick and interactive (you do have to fly in a team from the Netherlands though). I’m also playing around with the idea of trying one of the 360 degree lenses on a 5DMKII and seeing what I can do with the video. Another great idea to steal er. borrow! Only from the mind and baby face of Tom. They often seem less than thrilled to be greeted by my baby face and currently very uncut hair. I try to make up for this by referencing my 97 careers, 13 children and then doing everything from the command line. You, my friend, are a genius! KD – you can’t steal what’s freely given and since I stole it from someone who stole it from someone else . . . we all know there’s no honor among thieves. 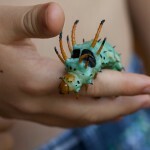 Jim – Trying to recapture the joy . . . glad someone out there is with me. Any chance of seeing some results?